A hearing aid is a miniature electronic device which uses a microphone, tiny computer chip and speaker to provide amplified sounds. Our experienced audiologists will test your hearing and determine if you are a candidate for amplification. There are many different kinds of hearing aids. How do I know which one is right for me? You’re right! Between the different manufacturers, levels of technology, styles of hearing aids and how much amplification you need for your hearing loss, there is a lot involved in selecting the right device for you. Fortunately, it is our job to guide you through the hearing aid selection process. We study year round the latest technology and research in the field, so we can be the experts you can trust to help you hear better. The RIC hearing aid, is a device that sits behind the ear with a very thin receiver wire that comes around the front of the ear with the speaker sitting in the ear canal. This hearing aid is ideal for patient’s with a mild to severe hearing loss, as it leave s the ear canals open and allows for a more natural sound quality. The BTE hearing aid, is a device that sits behind the ear and is connected to a custom earmold by a tube. 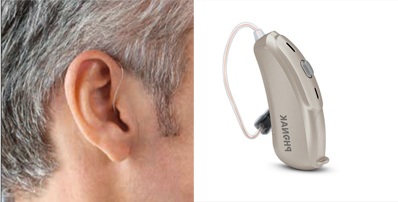 This hearing aid is ideal for patient’s with a moderately-severe to profound hearing loss, as it allows for more power from the hearing aid/s. These are custom hearing aids, made specifically for one patient. They are ideal for those who have trouble with dexterity of their fingers.